Abstract: The GeForce 7300GS sets the bar a little higher in the entry level market, for those of us who aren't willing to plunk down $600 on a slab of PCB. While most of the attention the last few weeks has been focused around the ATI Radeon X1900 XTX & nVidia GeForce 7900GTX, the mainstream nVidia GeForce 7300GS videocard release has gotten little press. Perhaps we've been spoiled by playing with the latest and greatest, but that doesn't take away from the fact that the GeForce 7300GS is a real gem! Perhaps it's the perpetual underdog status that entry level videocards have, but when a game friendly GPU is released that is dead affordable, it just seems to taste a bit sweeter. Considering how lucrative the entry level market can be, it is a bit surprising to see ATi's lackluster effort to compete against nVIDIA's GeForce 6200TC and now its new Geforce 7300GS offering. Not that it matters much, even though the competition is thin nVIDIA is still packing a ton of value into these little graphics cores. The GeForce 7300GS sets the bar a little higher in the entry level market, allowing software developers to make games that are more advanced overall and not worry as much about alienating the rest of us who aren't willing to plunk down $600 on a slab of PCB peppered with a few microchips. The Albatron GeForce 7300GS128 is one of this new breed of entry level videocards, and it packs a decent 3D punch for around $90 CDN ($78 USD/$45 GBP). The tiny 90nm nVidia Geforce 7300GS GPU is backed up with 128MB of GDDR2 memory, and it has the special ability to page another 128MB of system memory for a total of 256MB. 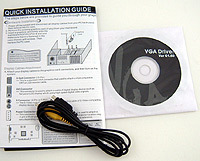 We'd recommend the minimum system memory for a WindowsXP computer be at least 512MB when using this Albatron videocard. 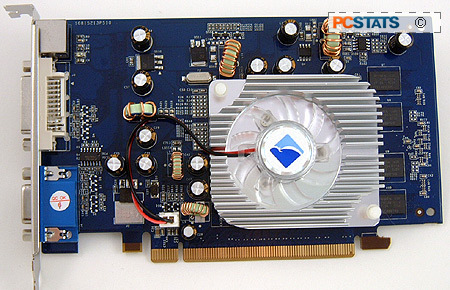 The Albatron 7300GS128 is a PCI Express x16 videocard which fully supports dual monitors with its DVI and analog outputs, and even includes a TV output jack which can come in handy. Virtually all videocards these days are based on the reference design from the GPU manufacturer, and the Albatron GeForce 7300GS128 is no different. The Albatron 7300GS128 is quite compact with an overall size of about 16.5 x 10 cm, so it won't have any difficulty fitting into smaller PC cases like the ones used with many OEM computer systems. The GeForce 7300GS GPU is not a raging inferno, so the Albatron 7300GS128 videocard happily makes due with a quiet little aluminum VGA heatsink. The 45mm fan does not have RPM monitoring or speed controls, but even still with it running at full speed the little fan is barely audible. During times of intense 3D load, the videocard reached moderately warm temperatures, there's little to worry about should a fan fail years down the road. 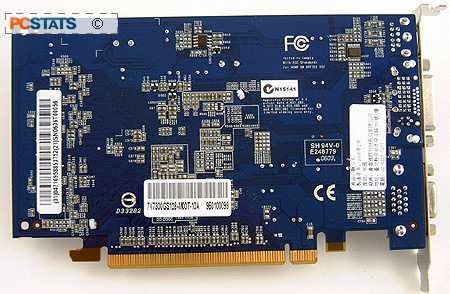 The Albatron 7300GS128 videocard has 128MB of onboard Hynix DDR2 memory, which lessons the need to page system memory - memory installed onto your motherboard used by the rest of the computer. On the occasion that there is a need for more memory, the Albatron videocard will use up to 128MB of system memory as its own. There have been a few people who have written in asking about PCSTATS why the GeForce 6200TC and now Geforce 7300GS only come out in PCI Express flavors... why aren't their 8xAGP unit especially since the majority of PC's out there still use this standard? The reason is that the AGP bus does not offer enough bandwidth (2.1GB/s) to the videocard to allow it to store graphics data on the system memory. The PCI Express x16 interconnect on the other hand has a comparably whopping 8GB/s bandwidth available to it. This 8GB/s is plenty to share between the videocard itself and to be used as a highway between the GPU and paged system memory. Pg 2. Will a GF-7300GS Overclock?